I am so glad you are back here checking out this week’s One Room Challenge: The Nursery Week 3 Progress! Don’t forget to check out all the featured designers and guest participants over at Linda’s blog Calling It Home. Well I felt like we were really making lots of progress last week, and this week…well, our progress leaves something to be desired. In our (or maybe just my really since this is no fault of my husband’s) defense, I cannot make a decision on carpeting. I really need to decide so we can move on, but big decisions are not my thing. I dread them and am seriously the worst at making them. I feel like I am at a stand still until I make this stupid decision. On a good note, we did get a bunch of things purchased. After all your votes, I decided on the Jenny Lind Crib in lagoon. I can’t wait to see it! I am really hoping that I like the color and that we don’t have to send it back. I think because of the crib color, my coral and mint nursery is now leaning more towards coral and teal. Oh well, I love teal too! We purchased thermal black out blinds from Lowe’s too. I don’t think I realized how expensive blinds are, geez! I can think of a lot more interesting things to spend our money on than blinds, but oh well! It will be nice and dark and cozy for our munchkin. I think they will look great with our beautiful curtains coming from Minted.Com! They are the Moroccan Zillij pattern in Coral. I just got an email that they are on their way, and I can’t wait! Our chair did arrive from Target and it is put together and I love it! It is the Rowen Glider in Dove Gray and was soooo easy to put together and looks great. It is on sale this week and you get a $50 dollar gift card with purchase, so if you are looking for a glider, this is a great one to buy! I think the sale promotion runs until Sunday, April 23rd. I have also been picking up accessories for a gallery wall and have amassed a ton of stuff! I probably have too much, but it so hard to edit yourself when everything is so cute! Here are some of my items. I hope next week to have the carpet decided on, the book shelves up, and the crib assembled! Wish us luck! Below are some of my favorite baby products that we used with our older daughter! I couldn’t have lived without them! I am excited to see the crib also! I always wanted a jenny lind crib but sadly 4 babies and no jenny lind crib. So I will live through you haha! I love the direction you are going with the gallery wall! And the curtains… So pretty! I love it all! The crib just came, and I can’t wait!! Thank you so much…I am not the best at gallery walls so I hope I can pull this one together! I can’t even imagine how cute that crib must be in that color. Everything you’ve chosen is so perfect…that’s going to be one adorable room. Thank you so much Stacey! I can’t wait to get the crib set up and in the room! I’m loving all the art! It’s good to have lots – I remember walking around with my littles talking about it all to help soothe them and teach them. Thats a great idea! We all need something to talk about during those 3 am feedings right?? I love that color of crib! Its funny how plans can change as you start working on the room. My bathroom redo was suppose to be grey, but I kept it all white once I saw what it looked like with it primed all white lol. I love it so much! I have a hard time making the ‘big decisions’ too! Your not alone on that. Those curtains are just fabulous. What an absolute delight this post is!!! Thank you so very much for joining the gathering at Thoughts of Home on Thursday. I *love* your picks! And there’s no such thing as too many accessories. Excited to check back next week!! Thank you Molly! I have quite the stockpile of accessories hiding in the closet! I can’t wait to put them all out! Super cute! That crib is adorable and will look so good with the curtains. I’m having the same indecision problems on my ORC room, it is really slowing me down! I love your gallery wall, I can’t wait to see how that turns out. Ugh I’m glad its not just me Roxanne…Thank God we have a timeline or else I would probably never make the decision!! 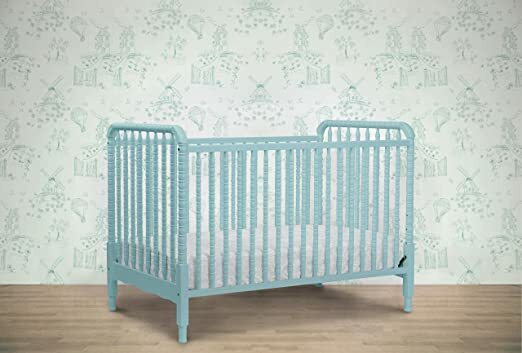 I love a Jenny Lind crib and that color is so gorgeous! It’s going to look great! This nursery is going to be adorable! I love the curtains and glider you got, and like you, I always purchase WAY more than I need, and return what doesn’t end up working in the space. I’d rather have a lot to choose from than not enough. Good luck with the carpet! I am so excited to see your room put together! The colors are beautifully put together and I love your plan for the gallery wall. Everything just looks perfect. Oh Amanda, this is all coming together so nicely! I love all that you have done and the chair is amazing. I love the crib and I’m with you on the blinds – so expensive! It’s going to be great though! I am glad I am not the only one with blind sticker shock!! 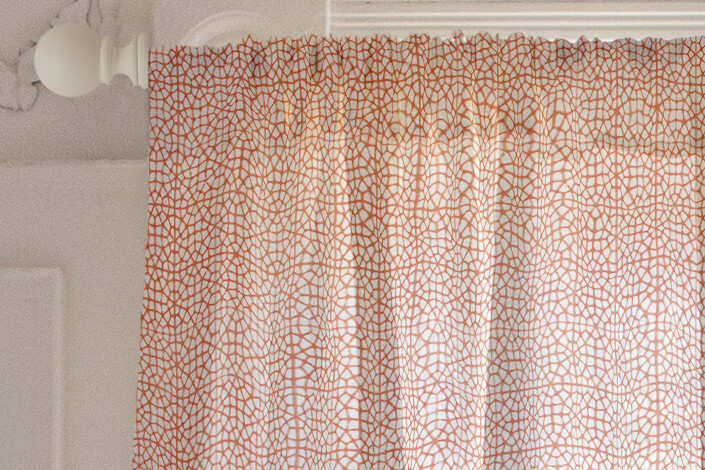 Who wants to spend hundreds of dollars on something you cover with curtains?! Oh well! Love the gallery wall items. Looking forward to seeing you progress next week. So glad you went with the lagoon–I hope you like it! It’s funny how our plans morph, isn’t it? I am feeling like my nursery isn’t as bold as I pictured it, but I am still liking it. Anyway, totally agree with you on blinds–that is probably one reason I went for the embarrassingly cheap roller shades–GASP! And our glider arrived, too–so fun to share such a similar ORC journey with someone! 🙂 Those curtains from Minted are going to be beautiful and I love all of your artwork–especially the little chicks–so sweet! Can’t wait to see more! Lol and I feel like mine is turning out more bold than I had planned! I thought I was going to go so neutral!! Hey no shame in those roller shades! We have them in my daughter’s bedroom and they work just fine…they just don’t fit our 115 year old window frames very well. I love sharing this journey with you! I love your nursery and can’t wait to see how it turns out!! I love Jenny Lind furniture Amanda! Can’t wait to see your finished nursery. I agree that blinds are way too expensive. I love everything you picked out, especially those curtains. I can’t wait to see it all come together. Thanks Katy…it is finally starting to come together! Amanda, that crib is gorgeous and will look great with the art you’ve picked out for the gallery wall. Love how it’s all coming together. Thank you! I can’t wait to see the bedding on it!! That crib is amazing! Can’t wait to see everything all set up. And your gallery wall is adorable.